Portable traffic lights are an easy and hassle-free option when it comes to use in road work sites, event traffic control or management and all traffic control in general. Our lights come with an easy to operate controller, taking the stress out of your next project. All of our portable traffic lights are designed and manufactured in Melbourne, Australia, using the latest technology. Why choose our Portable Traffic Lights? 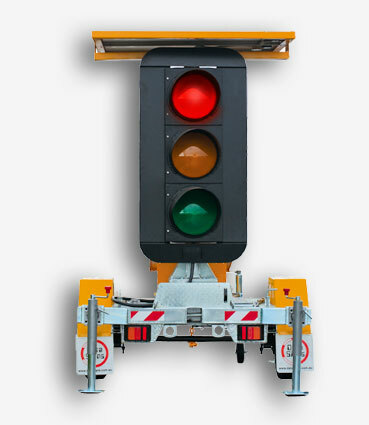 Our portable traffic lights are easily movable for greater convenience, Along with the come equipped with a controller which is easy to operate when controlling the traffic lights, they are solar powered and we provide a 12V maintenance free battery pack which will ensure continuous operation. The traffic control signs utilise very low-power LEDs which emit ultra-bright lights for an optimal view. They also have an electric hoist for a fast setup, and even have a GPS anti-theft and tamper tracking device built in. Our traffic lights come with various operational control functions and are built to Australian standards. To find out more, get in touch with us today!